section for additional easy shake recipes and cocktails you can mix up at home with A-List Amino Booster. Create your own fat-burning amino boost! 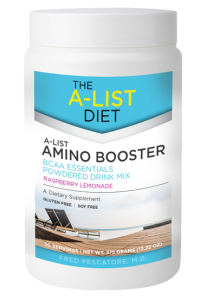 Your A-List transformation begins right here with the A-List Amino Booster. 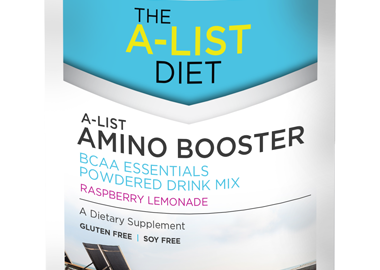 This powdered drink mix is formulated with BCAA Essentials to help you curb hunger, boost your metabolism, and fuel your body for weight loss.Instead of tracking down an array of different BCAA powders, you can get the A-List essentials right here in this refreshing raspberry lemonade mix.This unique formula is a delicious starting point for your personalized A-List Amino Boost plan, and is fast becoming a favorite “shortcut” of A-List dieters everywhere.You can mix it with cold water for a light, refreshing drink that stands alone. Or, create your own go-to Saturday night cocktail by blending it with ice and a shot of vodka. Morning fuel for your weight loss! Start the day off right with this protein boost shot designed to supercharge your weight loss. The A.M. formula, with 3500 mg of BCAAs, helps rev up your metabolism for the day ahead so you can take it as soon as you wake up. It also includes a dose of DMG to support a healthy metabolic system, which is critical to A-List success. 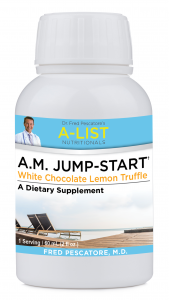 Plus, the shot of cocoa bean extract makes the A.M. Jump-Start a delicious way to help maintain healthy blood sugar, fight free radical damage, and keep your entire metabolic system healthy. Best of all, the rich chocolate taste will satisfy every craving—without all the guilt. Each liquid shot is ready to drink in a convenient, go-anywhere bottle, so there’s no measuring or mixing required. Every dose is perfectly designed to help you reach your goal weight. It’s never been this easy—or delicious—to conquer cravings and power-up your fat-burning engine. Keep your metabolism revved overnight! The P.M. Reboot protein boost shot helps keep your metabolism humming along until morning. Take it in the evening or before bed to soothe away the day’s stress and strain, and support your natural recovery process as you rest. 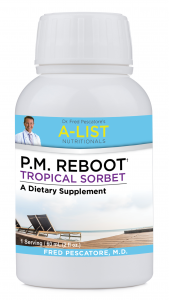 This refreshing protein boost formula also features the natural antioxidant power of turmeric, to promote a healthy inflammatory response, fight free radical damage, and help guard every component of your metabolic health. Each liquid shot is ready to drink in a convenient, go-anywhere bottle, so there’s no measuring or mixing required. No other “bedtime snack” has ever been this rewarding!